Luckily, more and more sites and apps are experimenting with alternative, more efficient solutions for this very problem. None of the ideas listed here is better than the others, their viability and performance obviously depend on the content and the context. If you have a limited number of sections in your website or app and users should be able to quickly switch between these sections, a tabbed navigation might be the solution. You could argue that the ‘more’ item isn’t better than the hamburger menu (it’s kind of hidden and its label does not refer to its content at all), however, if you have made the prioritization right, most users will be looking for one of the four visible items anyway so the navigation experience for the majority will still be improved. This means that the More menu contains more items on a lower resolution?—?items ‘jump’ under More when there’s not enough space to show them. The flexibility of this solution provides a better experience than the ‘tabs + more’, especially on in-between screen sizes. The downside of this solution is that still only the top few items are visible without scrolling and all the remaining ones are off the canvas. This is, however, an acceptable solution when the users are expected to explore the content, e.g. in a web shop or news categories. As far as visual design is concerned you need to make sure to provide enough visual hints to suggest that there are more elements available upon horizontal scrolling (e.g. by fading and/or off positioning the last visible element). The dropdown menu actually has a double role in this case: first, it serves as a page title and the downward arrow suggests that there’s a possibility to quickly switch to similar sections. Although the options are hidden in this case, the dropdown design suggests that the list would contain options that are either siblings or children of the current page (and it should primarily be used for this purpose). 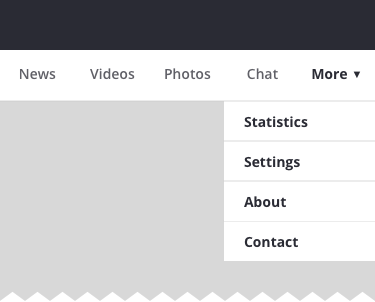 Since the main downside of the hamburger menu is its low discoverability, it’s recommended to consider one of the alternatives when it comes to designing the main navigation menu. However, when designing secondary navigation options, this pattern might be an appropriate solution. Since everything about this screen is designed to request a car, secondary options such as History and Settings should not be available more prominently than from a hamburger menu. Since the main functionality (switching languages and entering text to translate) is the most prominent part of the screen, the hidden menu is a great place to host sections like Help and Community. There isn’t a one-size-fits-all solution for mobile navigation, it always depends on your product, on your users, and on the context. What works well for others might not work for you and vice versa. However, the foundation of every well designed navigation is information architecture – clear structure, priorities, and labels based on your users’ needs. So why not start finding the most efficient mobile navigation for your product today?